Stop me if you’ve heard some (or all) of these before. The goal of today’s post isn’t to make training boring. It’s not to tell you what you can’t do. Rather, the goal is to tell you what you should do, before you get into some of the sexier stuff in your programming. When you go to school, you learn the basics of arithmetic first – addition, subtraction, etc. Once you’ve demonstrated mastery, you then move on to higher disciplines like algebra, geometry, calculus, whatever. So those basics are the prerequisites necessary to properly apply what you’d learn in the higher levels of math. And it’s my opinion that we need prerequisites when it comes to our training as well! Quite simply, why are we spending so much time training in the frontal and transverse planes when very few of our clients have mastered the most basic – the sagittal plane? As I started writing this post, I realized many of you may not be familiar with the planes of movement. Rather than ASSume, I figured a brief explanation would go a long way. Sagittal Plane – Motions that occur front-to-back. Think squatting, deadlifting, etc. Frontal Plane – Motions that occur side-to-side. Think of a lateral lunge or side-step. Transverse Plane – Motions that occur with rotation. Think about a med ball or Russian twist exercise. Now here’s one of the biggest misconceptions out there – that you have to actually move in said plane to achieve a training effect there! For instance, some trainers or coaches may tell you that if you want to work the frontal plane, you have to do lateral lunges. However, if you’re doing a traditional lunge or split-squat, the simple fact that you’re controlling your knee and keeping it from wavering side-to-side, or from rotating in or out, means that you’re literally training it to prevent motion in the frontal and transverse planes! I would argue that literally every exercise has a component of sagittal, frontal and transverse plane motion or stability. 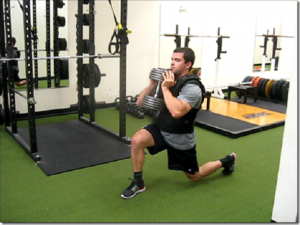 You can bet that this set of heavy lunges will require stability in multiple planes. The key is to remember that while big-bang movements like squats and deadlifts are going to be focused on the sagittal plane, they’re always going to have some element of frontal and transverse plane stability. In contrast, split-stance and unilateral lifts will still typically move in the sagittal plane, but you’ll need more and more stability or control in the frontal and transverse planes to be successful. If you want more info on this topic, be sure to check out my FREE Single-leg Training Video. Play along with me here for a minute. A new client shows up on your doorstep and after you review their posture, you see they have a significant anterior pelvic tilt and increased lumbar lordosis. You just attended an awesome weekend course on how to dominate life in the frontal and transverse planes, incorporating all kinds of cool 3-D movements into your programming. I sincerely hope you resist the urge to get fancy. Instead, fix what needs fixing, first and foremost! Think about this from a functional perspective. You see imbalances between the medial and lateral hamstrings, adductors and abductors, etc. If you don’t move well in the sagittal plane, I can guarantee you won’t move well in the frontal or transverse planes! 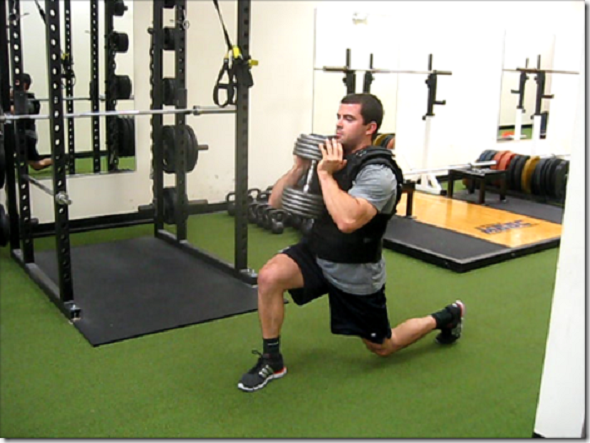 Moving well from front-to-back is a prerequisite to moving well side-to-side or with rotation. This is critically important, regardless of which side of the training spectrum you’re on. From an injury prevention perspective, getting them closer to neutral takes stress off the low back, hips, and knees. From a performance perspective, now you’ve unlocked two key areas for sports performance: a strong/stable core, and hips that move well and are glute max–driven. I know I’m going to get people asking this question, so let’s address it right now. If an athlete (as opposed to a fat-loss client) comes in with the above posture, I’m not going to change how I train them one bit. Think about this: Perhaps the biggest reason we train people in the weight room is to fix the things that need fixing. Even if they don’t move well in the frontal or transverse planes, why would I continue to train them there and hope that it improves? Can we see an improvement? Sure. Simply training and coaching someone properly on movement will go a long way to improve said movement. But, I know that if I can improve their posture, alignment, and stability in the sagittal plane first, that a lot of those other things will come along for the ride, with little to no coaching whatsoever! This is one of the reasons I’m such a huge fan of regressed postures early on. Whether it’s tall- and half-kneeling, quadruped, or even supine and prone, I know that I can give them more control in the sagittal plane, that will absolutely carry over to other postures and positions. Start to think about your training (or that of your clients and athletes) as a hierarchy. One of said hierarchies is the planes of motion, and sagittal plane stability and control is the foundation. Master the sagittal plane first, and I think you’ll be surprised at how well you start to move in the other two! Great post! From my experience, if you clear up the soft tissue adhesions preventing the sagittal plane, the cheater muscles, then improving strength in the sagittal is much easier. This process can be performed for frontal, transverse, and then posterior sagittal, typically the hardest plane, in regards to the core. Great article… Very well written and informative! Thanks Big Joe! You’ll be getting a shout-out here soon so keep reading the blog! So true. Pavel Kolar has been teaching for the last 15 years on just this topic. Namely, that sagittal plane stabilization is where we should start since the motor program is primarily designed to achieve upright posture in humans. I wrote on this in a blog – http://www.craigliebenson.com/?p=1676. Great stuff – thanks Craig! I actually just recently attended a “3D” seminar with Gary Gray! Smart man, very smart man indeed:) I do see and understand your point here, thanks! Wow, this is a super interesting and inspiring subject to think about! I am a patellofemoral recoveree 😉 and I’ve made it my business to read your blog along with many other’s like Mike Reinold. I sincerely have found a new passion with this stuff! I’ve been working diligently to get stability back through my core, hips and glutes and it’s made a world of difference. Thanks for elucidating this topic! A lot of colleagues criticise my approach because if my athletes can’t double leg squat, lunge, and deadlift properly I don’t let them do single leg, or other plane direction work until they can. Darren – Honestly, I think there’s something to this. I could make a very strong argument for this myself. I don’t quite understand your APT example. Are you saying that anterior pelvic tilt/lumbar lordosis is an example of how a sagital plane dysfunction limits one’s ability to produce or control transverse plane movement, and therefore APT clients should be trained in the sagital plane until they become pelvic neutral and then can progress to multiplanar training? I am learning kinesiology, and I was wondering if you wouldn’t mind elaborating on a couple of things in the article for me. 1) “Moving well from front-to-back is a prerequisite to moving well side-to-side or with rotation”- could you please explain this? 2) When you say that sagittal is the most basic plane, could you please expound upon this? great blog and explanations… super easy to follow, thank you.